Balloon Ride in Cappadocia: every day up to 100 hot air balloons rise at sunrise! A unique experience, with a fascinating view of Cappadocia and the opportunity to see the sunrise in one day! 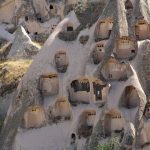 Underground Cities / Ancient Cave Towns: Cappadocia has dozens of underground cities /cave towns had been housing thousands of people since the early ages, reaching as far as 20 storeyed below the soil, and some are more than 3,600 years old! The commonly knows are Derinkuyu, Kaymakli and Ozkonak with some tourist facilities and modern lighting systems. Uchisar Fortress(Castle): a fortress built in the rock from the Roman period, on one of the highest points in Cappadocia, with a wonderful view of the whole region. Göreme National Park: UNESCO World Heritage with dozens of cave churches, among the most beautiful in all of Cappadocia! Ortahisar Fortress: the second most important fortress in Cappadocia also from the Roman period. Sarihan Caravansarai: ​​in the lodges for traditional caravans, the story of 1001 Nights emerged, one of which is the well-preserved Sarihan in located in Cappadocia. Whirling Dervishes Show/Turkish Night: Its believed that the monks of the Mawlawi Order meditated through their dance. Visit one of the performances of the “Dancing Dervishes” in the evenings in Cappadocia. Zelve Museum: the cave village, which was abandoned in the fifties, is today an open-air museum. Ihlara Valley: a 15-kilometer-long canyon with over 50 churches carved into the rock. They date from the 11th to the 14th century. Avanos: the small town has a millennium-old pottery culture, already the Hittites produced wine jugs in the small town 3000 years ago. Visit pottery, take a gondola on the Red River, stroll through the bazaar or enjoy the food in the old town restaurants. Fairy chimneys all around Cappadocia: are up to 30 meters high sandstone pillars that stick out of the landscape everywhere in Cappadocia like an asparagus spear or a phallic symbol. They have been shaped by erosion over the last 20 million years.